If I look back and think about it, I always had two distinct associations for violets. They co-existed in my mind as if they belonged to the completely different subjects, not affecting each other. 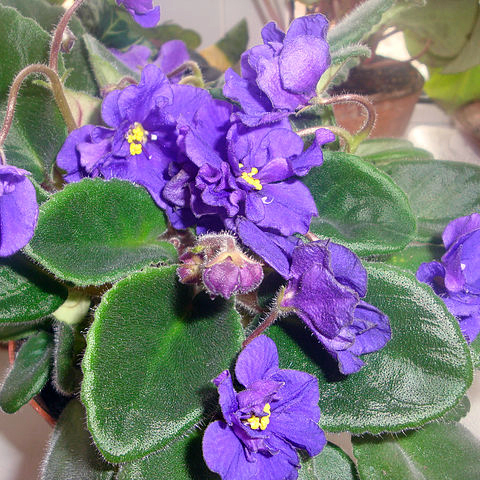 A violet is a completely boring, slightly wilted small flower in the pot on a window sill. A violet is a tender flower somehow related to romantic love, Paris (street flower girls), Toulouse (violettes de Toulouse) and all such things that seem romantic when you’re young. But somehow neither of these two associations ever included a smell. I never thought of violets as of flowers that have a scent. Most likely, because the only variety I’ve ever been close to didn’t have any. So in this quest for the perfect violet perfume I’m not searching for the most realistic rendition of a violet since I still have no idea how that flower smells. I’m looking for the best implementation of the idea of a violet. Based on a commonality in all the violet perfumes I tested I reconstructed this note for myself. As I did it before for lilac and linden I combine this episode of the Weeklong Test Drive (it features two Tom Ford’s violet-centered perfumes) with my periodic Single Note Exploration for the violet note in perfumes. Verte Violette by L’Artisan Parfumeur – created in 2000 by Anne Flipo, notes include violet leaves, raspberry leaves, rose, heliotrope, cedar, iris, white musk. It’s fresh, very light, bright and happy fragrance with a nice violet note that starts a little dirty but then clears up and stays as a nice skin scent. Verte Violette is the easiest and lightest scent out of all I tried. Like many other L’Artisan’s perfumes it’s fleeting: I can barely smell it after an hour. I like Verte Violette but I think it’s too expensive to bathe in it. So, unless a bottle falls from the sky… For a real review read Now Smell This. Violet Blonde by Tom Ford – created in 2011, notes include violet leaf, Italian mandarin, pink pepper, Tuscan iris absolute, Tuscan orris butter, Sambac jasmine, sampaquita, musk, suede, cedar, vetiver and benzoin. There is no personal story between me and Violet Blonde, everything happened very fast: I knew about the upcoming release, I went to the store, tried Violet Blond, liked it and jumped on a split as soon as I saw one. I enjoy wearing it. Violet Blond has a very good longevity – more than 8 hours on my skin. Had the juice (or at least a bottle) been purple, it would have been an immediate full bottle purchase. Now I plan to go through my small decant and if I still like it I’ll buy a bottle of Violet Blond for my collection. All the great reviews for Violet Blond that I read, I read after I made up my mind about this perfume (and I feel a little proud of myself because of that) but since they all are so recent I’ll skip even my “not-a-review” impressions part and just provide links to the reviews on friendly blogs: Olfactoria’s Travels, The Candy Perfume Boy, Bonkers About Perfumes. Wood Violet by Sonoma Scent Studio – created in 2008 by Laurie Erickson, notes include violet, plum, cedar, cinnamon, clove, sandalwood, violet leaf and musk. I tried Wood Violet for the first time in winter (our Northern California winter, but still). I liked what I identified for myself as a “violet” component of the perfume in the opening and then in the dry down phases but in the middle something smelled too… dirty (?) and unpleasant. I put the sample aside for a while. One sunny warm day I decided to give Wood Violet another try; and this time the earthy smell felt right in place: it was a scent of spring. For a very short time in the beginning I smell some sweetness but then it goes away and the scent stays on my skin green and woodsy for the next 3-4 hours. Wood Violet is quiet and powerful at the same time. I do not need a full bottle of this perfume but a nice purse spray one day will find its way into my collection. Violet Angel by Thierry Mugler – created in 2005 by Francoise Caron, notes include violet leaves, crystallized sugar, violet, woody note, patchouli and vanilla. Violet Angel smells as if original Angel ate a whole garden of violets. Wait… If I remember it correctly, it did eat the whole garden of different flowers – roses, peonies, violets and lilies. But let’s look just at this act of gluttony. Violet Angel is slightly less sweet than the original perfume, it has some woodsy note and, if you concentrate very hard or have another violet perfume for the reference on, let’s say, another wrist, you can smell some violets, sugared violets. But Angel’s signature caramel (in case of Angel Violet it’s called crystallized sugar – which is the same thing)-patchouli-vanilla is too prominent and too recognizable. I haven’t tried other flowers yet but, in my mind, violets are the least suited to be an Angel modifier. It isn’t different or special enough for either Angel fans or Angel haters. I’ll stick to my beloved Angel EdP. Black Violet by Tom Ford – created in 2007 as a part of the original Private Blend collection, notes include bergamot, citruses, fruity notes, violet, oakmoss and woodsy notes. It opens a citrus scent blended into sweet fruity notes, then almost immediately citrus goes away leaving slightly dryer but still sweet enough floral scent with a nice wood note. For me Black Violet is not a transparent scent, it has substance. I think “dark” part suits it well (though I remember reading the opposite opinion from other reviewers). I like Black Violet it the most 2-3 hours into wearing. It lasts for 12+ hours on the skin. In the final phase (and only there) it smells similar to Violet Blonde. I want to add Black Violet to my collection but, the same as Ines from All I am – a redhead, who recently reviewed Black Violet, I’m not ready to pay the price of a 50 ml bottle (and I do not need a bigger bottle – which would make price per ml much more tolerable). So if anybody comes across a friendly split of this perfume, please let me know. Do you have a favorite violet perfume? If you’ve reviewed it on your blog, please share a link.